It’s that time of season when the weather cools down, leaves begin to change and if feels like fall. For most of us it means HALLOWEEN and finding the perfect costume for that amazing party you’ll be attending! For us at Ann Elizabeth it also means creating the perfect invitation for your Halloween party! A creative and professional Halloween party invitation is a great way to get all your friends excited to show off their costume and role play their character for one night. We thought we would spotlight one of our all time favorite Halloween invitations this week to show you just how good looking a Halloween invitation can be. This invitation definitely gives that creepy vibe from the webbing print on the envelope to the black spider and web on the main piece. The invitation itself has a nice, thick feel with it’s multiple layers; also giving it extra pops of metallic color. This invitation surely grabs the guests attention and gets them in the mood for some Halloween fun! So if you're planning a Halloween party and need the perfect invite call the experts at Ann Elizabeth and let us help you knock the socks of your friends with an amazing custom invitation! Here at Ann Elizabeth we're a lot more than a one trick pony. Sure, we love designing wedding invitations, but we also have lots of fun with other design projects as well. Our client, Dustin Schrecengost, recently joined the staff of skilled professionals at Blakemore Real Estate as a licensed realtor. Our friends at Blakemore Real Estate sent Dustin our way to design and print an announcement for him and we like it so much that we thought we'd share. We started with a gold and black color palette and developed the announcement from there. The whole announcement pulls out of a nifty pocket and there is a removable business card attached to the announcement. 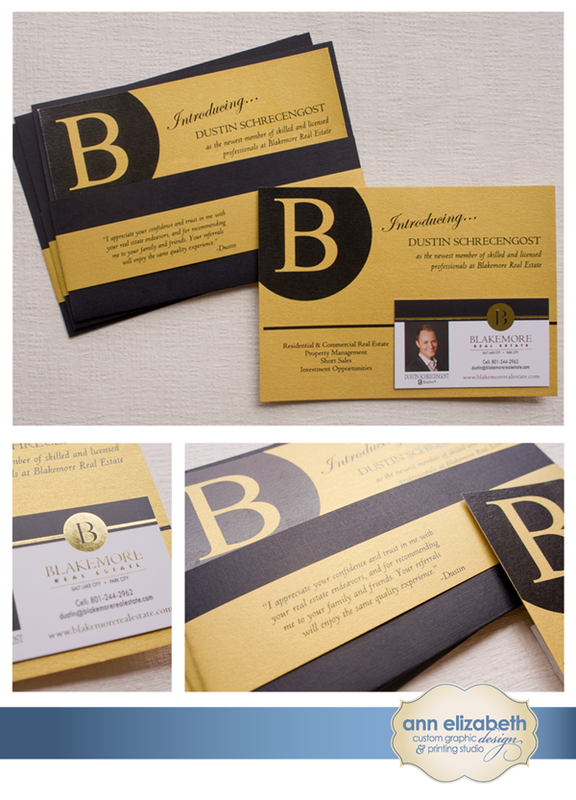 The business card itself features a matte coating and a shiny gold foil logo. So, even when the announcement is long gone, Dustin can rest assured that his business card alone still packs a punch. Have you made a business move lately? If so, sending a business announcement of the change is a social grace that your clients are sure to appreciate. Anything from a move of location, expanding office space, moving to a new company, a new phone number any business transition is noteworthy. More than anything else, it keeps your name in front of your clients and lets them know that you care enough about them to keep them in the loop. In all my dealings with professionals, I must say that Blakemore Real Estate really pays attention to the details and their customer service is pretty incredible. These guys really know what they are doing. So enjoy Dustin's announcement and think about sending a business announcement of your own. It's sure to instantly make you look like a pro.